While testing every model of TrendNet wireless routers would be very time consuming, a look at a few models gives us an idea of how well they would work for your average office user. The verdict? The TrendNet wireless router series proves to be moderately capable for the small business owner or other person working from a home office. These wireless routers support the current encryption standards including WEP, and WPA2. The TrendNet wireless routers support Network Address Translation (NAT) as well. They also support DHCP, both as a client and a server, as well as the ability to create specific routing paths to computers that need the ability to bypass the usual NAT structure, and come with some access types built in, although for the most part, these are gaming oriented. 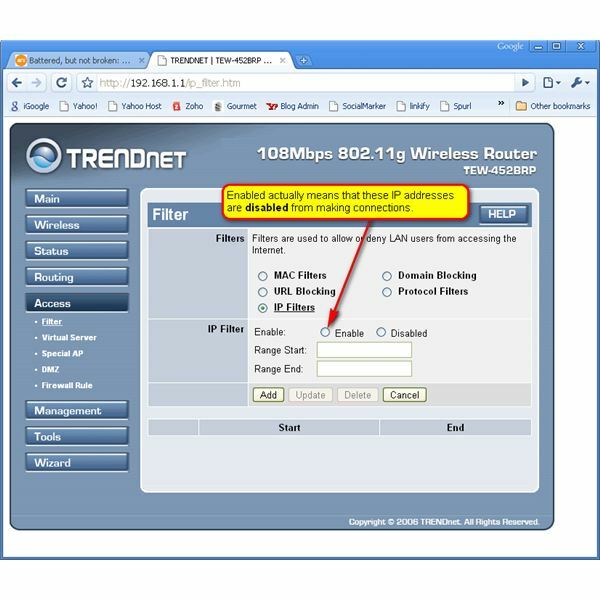 The difficulty with the TrendNet wireless products is the clunky management interface. As a home office user it is likely that there will be a need for specialized products like video conferencing solutions. In addition, for remote workers, there will be the need to run in-house applications such as budgeting, accounting, or collaboration software. Many of these products will require a specific configuration to run properly. The issue with the TrendNet router is that setting up these configurations is not intuitive and in some case, very confusing. For example, a common requirement for specialized, heavy communications, software such as video conferencing, or other video based software is the ability to make a specific connection to the computer in question through the wireless router. This connection is known throughout the industry as “forwarding the port." However, the TrendNet router interface does not have “Port Forwarding" or anything of the sort. Instead, a home office user has to dig deep in the documentation to figure out that creating a “Virtual Server" is how one forwards a port. This is unnecessarily confusing and will make it difficult for non-computer experts to follow the setup instructions from the home office or software vendors. This is further illustrated in the design of the security options. In the IP Filters screen, entering a range of IP Addresses and clicking selecting “Enabled" actually disables these IP addresses from accessing the network or Internet. The confusion is because in this case, Enable means to enable the filter, which this disables the access. The interface abounds with this kind of confusion. Home office users don’t have the time to parse this kind of language trickery. Finally, the TrendNet seems to be missing some common functionality found in other, even low end, wireless routers. While the TrendNet supports DHCP to give IP addresses to clients automatically, there is no way to reserve an IP address for a specific client. So, if you go through all the trouble of figuring out how to setup your main computer through the confusing interface as 192.168.1.10 there is no way to make sure that your main computer gets the 192.168.1.10 address. Instead, another device on your wireless network might get that number and then, you would have to re-setup the configuration. In all, the TrendNet wireless routers do provide the necessary functionality for basic users who won’t need any sort of specific configuration, but for home office users, the products come up a little bit short, especially in the confusing interface and missing advanced functions. For home office users, better choices are easily available, and this product line should be skipped.